Fun news: another oil price shock is coming. How can I tell? Simple. The price at the pump is already back above $4/gal. There was a debate last December (on The Oil Drum) about 2012 barrel price projections. But, as Voltaire noted, Les hommes discutent, la nature agit--we can quibble about our projections, but the ultimate arbiter is what actually comes up out of the ground and who gets it. This is something the U.S. is losing. Oil production began to plateau in 2002; in 2005 China and India became major buyers Hoovering up all the world's excess crude. In 2005 the U.S. ceased to be the world's crude sink. 2005 was peak oil for America. It was the peak of availability, note, not of absolute production. That has not yet indisputably happened. But since 2005 India and (especially) China have been the buyers of choice, those who get first crack at oil, while the developed world has had to make due with decreasing local supplies. This has, unsurprisingly, led to slow but sure increases in U.S. gas prices. In 2006-7 wanton speculation in the oil futures market (an early reaction to a local collapse of the housing market that actually began in 2006) led to a steep rise in the price of gas, leading to the first price shock, which in turn catalyzed the more general collapse, particularly in the housing market, we saw through 2007-8. With that collapse, the price of gas dropped to unsustainable lows, and has since been increasing in lockstep with the economy's inchworm improvements. But the final straw that brought about this collapse was the fact that the price of gas became too high to bear. $4/gal seems to be the critical threshold, beyond which non-automotive transportation options, whatever their limitations, become mighty appealing. And we find ourselves back at this threshold early this year, before the spring or summer traveling seasons have even begun. A key issue is the long-term ramifications of the Arab Spring and the Iranian oil sanctions, both of which have essentially taken Mideast oil supplies off the map. Continuing political tensions there will continue to effect oil prices. But this is key--unlike with the last price shock, there is no clear evidence that speculation was driving an unsustainable bubble. In fact, it seems the opposite is true. The price of oil is up because (a) production is as flat as it has been for a decade (this is in accordance with realizations of Hubbert peak theory) and (b) China and India have fast become "thirsty" countries. In fact, I posit the supply of oil in China and India will be inversely proportional with the supply in the developed world (the U.S., Canada, Western Europe, Japan, and Australia). In the long run, these two demand blocs will just about evenly split the balance of the world's oil demand, but this is not going to happen without severe economic adjustments in the West. But--$4/gal is the critical mass beyond which Americans will begin en masse to seek alternative transportation options; we can expect $4.50 or even $5/gal gas over the summer. And, to repeat: this will be the second oil price shock. Particularly late last year, when the oil price inexplicably dropped (Libyan reserves coming back online?) oblivious or in-denial Americans began to revert to their gas-guzzling ways. This came while at the same time the younger generation, when they could afford it, showed a clear preference for urban living. The economic reaction to this shock is very much up in the air. America is stronger right now; Europe is knee-deep in the Euro crisis (another debt crisis). But the dominant economic structure right now is deleveraging--each debt crisis is catalyzing another one, and will continue to, until debt burdens are enormously shrunk, if not outright eliminated. *Author's note: I originally used the phrases "battery cages of poverty" to describe towers-in-a-park and "barracks and battery cages" to describe public housing's urban renewal-era efforts, producing towers-in-parks and garden apartments, when writing this post. On the outside, this ambitious project, designed by Blackney Hayes, is akin to other ... Continue reading at Hidden City Philadelphia. In the news today, SEPTA's head, Joe Casey, is blasting the House Transportation bill. The problems with this bill are well known. Now, the bill is in one sense obvious political posturing. It is impassable in every sense of the word--no Democrat in their right mind would possible vote in favor of it. It is a transportation bill as the ultra-regressive Tea Partiers would see it. It completely ignores major changes in transportation demands occurring among younger Americans. It would benefit one constituency and one constituency only--the Tea Party's core constituency--to the exclusion of all others. But, in another sense, it is denial. Active denial. A willing ignorance, a nostalgia that we can return to the 1950s. The reality? We can't. The United States passed peak oil availability in 2005. Vehicle miles traveled, unsurprisingly, peaked at the same time. We just lived through one oil price shock--in 2007-8--and are ramping up to another one. This is something the new generation gets, in a very visceral sense, and whenever possible they're choosing to live where there's no need for a car to get through the day. This is our voice, a voice missing from the Tea Party and this boondoggle bill: we want, and demand--to the point that many cities now have powerful lobbies for them--bike lanes. We prefer taking mass transit. We usually have more than one thing going on at a time, job-wise, and time is precious. Too precious to be spent driving an hour or more every day. And those of us who have decided to learn about how our transportation system works, who want to work for it, also know that our roads far, far overbuilt relative to how much we can spend maintaining it, while everything else is utterly opposite. We know that the only way to reduce driving is to make driving less necessary and less convenient. And so the House transportation bill is utterly antithetical to our needs. I am starting a rail asset stock for North Jersey, and in the course of my research discovered the current NJ Transit network is only about 2/3 of the area's potential commuter rail network. An excellent example of this is the New York & Greenwood Lake line, built as in independent railroad linking New York City with a remnant glacial tarn in the Catskills. Eventually acquired by the Erie Railroad, it was an active commuter line until 1982, and part of it has been repurposed into the Montclair-Boonton Line. But part of the ROW is lost--at the bottom of a reservoir, in fact. This is an excellent example of viable disused passenger rail in North Jersey. This is Part III of a very long-term commuter rail plan. Part I dealt with Pennsylvania rail assets, with Part Ia as an addendum; Part II dealt with South Jersey rail assets. Despite having plenty of infrastructure in place, South Jersey currently has no substantive rail network. Only three lines serve this area, and they, for the most part, avoid the core neighborhoods. It should say something that, while the Pennsylvania-Reading Seashore Lines once had a large, complete South Jersey passenger rail network, only one--the former Main Line from Camden to Atlantic City--is still in use, and even then, split between heavy rail PATCO and commuter rail Atlantic City Line. Disuse of this infrastructure represents a waste--but a waste no different than the waste engendered by the disuse of viable commuter rail infrastructure in many other American cities (e.g. Pittsburgh, Detroit, Cleveland, etc.) Elsewhere, particularly in the Mountain West, work is being done to rectify this; however, there are still many places where even the idea of a passenger train is anathema. 2. An intercity network linking to the Shore destinations. Both networks historically converged on Camden's massive Federal Street terminal, which had ferry connections to the Philadelphia waterfront. A station also existed at Broadway, which was the terminus of the Delaware River bridge subway. From there the routes fanned out: to Trenton, to Amboy, to Toms River, two to Atlantic City (both converged at Winslow Jct. ), to Ocean City and Wildwood and Cape May, to Grenloch, to Vineland and Millville, to Bridgeton, to Salem, and to Pennsgrove. However, while it is reasonable to converge the commuter lines on Camden, it is preferable to converge the intercity network on 30th St. Station. 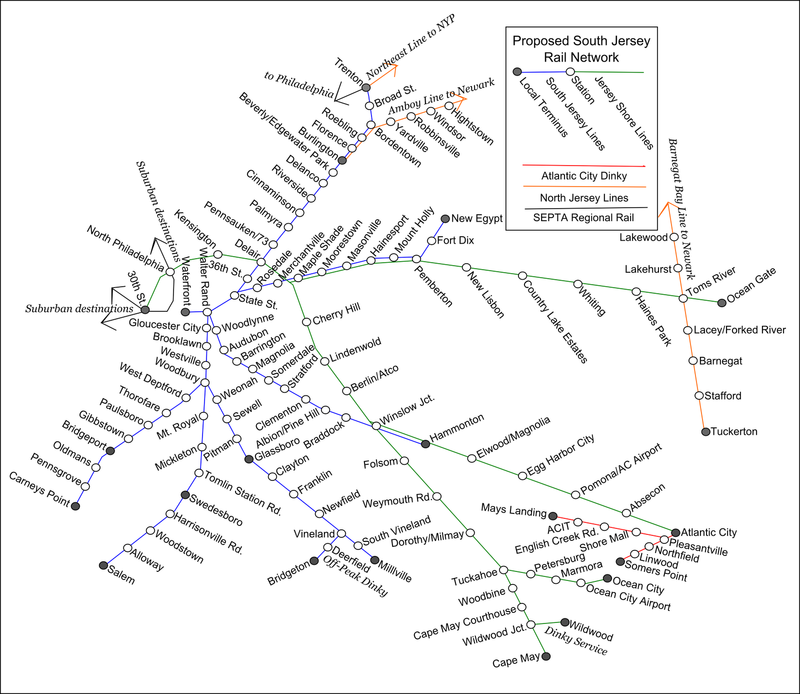 Six lines are viable commuter lines, four intercity, and two possible Atlantic City commuter lines. Two more lines are viable North Jersey lines which meet this network--for the time being, we'll assume these lines terminate at Newark, but we'll also want to look at bringing them to Hoboken, or better yet (if we as a nation finally decide to get our rear in gear and aggressively finance urban rail improvements) directly into Manhattan, perhaps via Staten Island. But that's for later. The four intercity lines run to Ocean Grove via Toms River, where it connects with a former CNJ ROW that would be viable for a passenger restart, and Pemberton, where it meets the commuter network; to Atlantic City via Winslow Jct., where it meets the Cape May line and the commuter network; and to Ocean City, which meets the Cape May line at Tuckahoe. A dinky would also service Wildwood from Wildwood Jct. on the Cape May line. All four lines would cross the Delair Bridge over the Delaware; only a single-track lift bridge, this presents probable capacity issues--even at hourly service, this represents a crossing roughly every 7.5 minutes (60/4=15, and you have to factor in that it's hourly service each direction, so 15/2). When the bridge needs to be raised (as it occasionally does), this will throw service times off--however, that is a compromise worth living with for direct Philadelphia service. Two small natural lines extend out from Atlantic City. Both can be serviced with light rail. These two lines lead to Mays Landing and Somers Point, respectively; the Somers Point line runs through a densely built-up area while the Mays Landing line accesses Shore destinations such as the Shore Mall and the Atlantic City Institute of Technology (abbreviated ACIT). The core network converges on Camden; there, passengers can transfer to PATCO (a fare union would be most advisable) or debark for local destinations. We will talk about the opportunities and pitfalls Camden offers soon. Tops on the agenda: figuring out how to bring a commuter rail throat into a city that willfully destroyed theirs during the '60s. The six lines reach Camden from: Trenton, New Egypt (Ft. Dix), Hammonton (via Clementon), Millville and Bridgeton (via Vineland and Glassboro), Salem, and Carneys Point (Pennsgrove). Let us tackle each of these in turn. The Trenton line is, more or less, NJ Transit's current River Line--the way it's set up is as FRA-noncompliant "light rail" that runs along trolley tracks through downtown Camden. The equipment the River Line uses, however, is a type of Stadler DMU related to the Flirt, which, if you recall, is one of the pieces of rail equipment that must be made legal in any sane rail regulation regime. If the FRA regulations went away tomorrow, it would be the favored type of equipment throughout the South Jersey network. There are two components to this line: the downtown Camden light rail line, and the commuter line, shared with a freight line, along the former Camden & Amboy main line as far as Bordentown, and its branch to Trenton thence. In order to build a true commuter network, the Camden light rail line has to be repurposed. (I will talk more about what this entails later.) So we'll concentrate on the former C&A line. This line connects with SEPTA's existing R7 Trenton Line and NJT's existing Northeast Corridor Line at (unsurprisingly) Trenton. Abandonment Repurposing of the River Line's existing Trenton terminus and termination on Penn Station's platforms--thereby allowing for cross-platform transfers--would be superior; the River Line's existing terminus is an artifact of the FRA's insanity more than anything else. A secondary terminus would lie in Burlington. Coincidentally, this would be the natural terminus of any commuter rail operation running down the former C&A main line from Amboy to Bordentown via Hightstown and Henrietta. 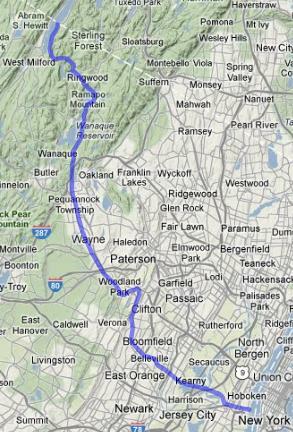 This idea has been marked as the Amboy Line on the above map, but will have to be considered in more detail whenever I get around to devising a commuter rail strategy for New York. The Trenton and Amboy Lines, considered together, can be considered the Camden & Amboy Lines, much like the Morris & Essex Lines, for obvious reasons. The Fort Dix line (which I affectionately think of as the Military Line) runs from Camden to the east, to Ft. Dix and a terminus in New Egypt via Maple Shade and Mt. Holly. East of Mt. Holly the right-of-way has been torn up, (but can still be rebuilt with the relocation of some local rail-trails). The Military Line itself curves north at Pemberton, whereas the intercity Atlantic Line continues to the east. The intercity line obviously runs express past many of the stops on the local line; it definitely stops at Mt. Holly and (maybe) Maple Shade. Beyond Pemberton, it stops at a couple of smallish hamlets and crosses another proposed North Jersey line in Toms River. The Clementon line follows the PRSL's former Clementon Branch, a core commuter line to Hammonton via Winslow Junction. Although it's not far to the south of PATCO, it would offer an alternative service type, and eventually, hopefully a different set of destinations. Local trains from Atlantic City can also terminate in Hammonton. The Millville Line is the core line of South Jersey commuter rail. Electrified once, a long time ago, this line extends from Camden to Millville via Glassboro and Vineland. Two other lines branch off in Woodbury; at Vineland the line splits into Millville and Bridgeton sections. The Millville section follows the former PRSL alignment, while the Bridgeton one follows a (mostly) CNJ one. This Bridgeton alignment would be served by an off-peak dinky but have half the peak trains go through utilizing the connection. At peak, the dinky can be utilized to fill service gaps for both the Millville and Vineland segments. 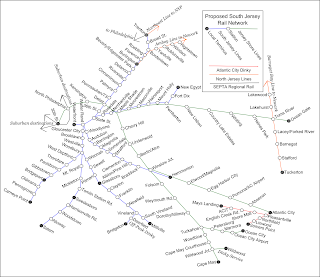 An intermediate terminus would exist in Glassboro. The Salem line utilizes a former PRSL alignment from Woodbury to Salem; it runs through some of the most rural areas served by the network. However, despite this rural character, it also runs through a core of small towns, like Swedesboro. Trains can run through to Salem, and Swedesboro would be a viable local terminus during rush hour. The Pennsgrove line runs along the east side of the Delaware, from Camden nearly all the way to the Delaware Memorial Bridge (Carneys Point). As such, it accesses a series of industrial towns mirroring those across the river, like Trainer and Marcus Hook. This line can expect to see high ridership, and has been outfitted with a local terminus at Bridgeport, whose location by the Commodore Barry Bridge's New Jersey approach makes it a potential fit for a park and ride (based on the rule that such infrastructure is most appropriate where hub roads enter the core urban area--that is, the city itself--where rail lines can meet them, and where hub rail lines (commuter or regional networks) cross the middle ring beltway, approximately 15 miles from the city center; US 322 fits the latter as far as I-295). Unlike the Ft. Dix line, the Clementon, Millville, Salem, and Pennsgrove lines all utilize existing former PRSL rights-of-way, still in freight use. In fact, the vast majority of the former PRSL network, and certainly the key lines, still exists as freight routes; what has been abandoned has generally been converted into rail-trails in populated areas (e.g. from the Turnpike south to Grenloch), and simply not built on in less-populated areas. Unlike the total loss of the former Ma & Pa right-of-way between Baltimore and Towson, a loss which has essentially screwed over commuter rail access to that region's densest suburbs, the vast majority of rail easements in New Jersey still exist, and can still be returned to passenger service. As previously mentioned, equipment such as that currently running on the River Line would be optimal for the vast majority of the Camden network. This is standard mainline equipment in Europe, and if our rail regulations were remotely sane should be reasonably inexpensive to procure and able to run immediately, without need for pointless variances. Our next steps will be to consider what it'll take to (a) provide for a suitable Camden terminal and (b) how to best repurpose the Camden light rail route. Note: This post originally appeared Tuesday. I have been very busy lately. Looking up at the louvers in the atrium roof. Drexel University has pinned much of its hopes for enticing the scholars of tomorrow on an aggressive building program. Even now the future LeBow College of Business is a building-shaped hole in the ground and the grass where the new American Campus Communities building is to go has gone away. Beyond ambition and having a reputation for a painfully ugly campus, the aggressive building program was necessitated by the campus’ large stock of aging, poorly sited, and in many cases functionally obsolete, mid-century academic structures. It’s the natural life-cycle–only in this generation instead of orange brick and urban denial, we’re getting green walls and engagement with the city all around. Some things do get better. For most the past decade, Drexel’s primary campus ambition ... Continue reading at Hidden City Philadelphia. Note: This post originally appeared Friday. The deepest part of South Philadelphia, south of the Schuylkill Expressway, is full of surprises. An Olmsted park graces the corner of Broad and Pattison–as does the NovaCare Center. The most most of us ever see of this area is the Sports Complex, or, if we work there, the Navy Yard. 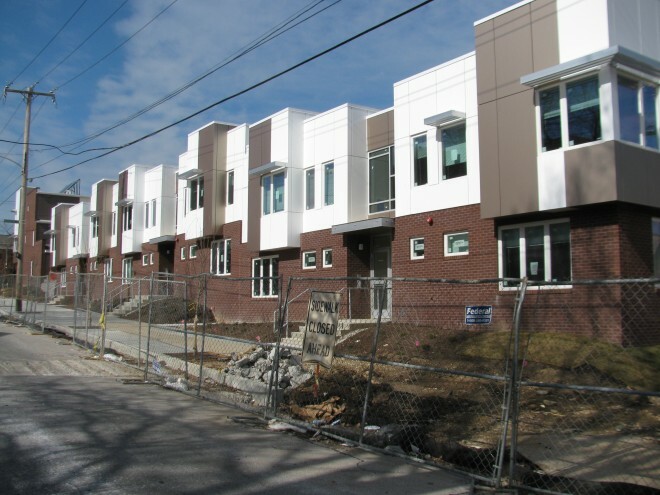 But behind the Navy Yard lies a swath of (mostly) post-war residential development that reflects the changing perception of ... Continue reading at Hidden City Philadelphia.